Learn more about top Vision West students and see their work here. 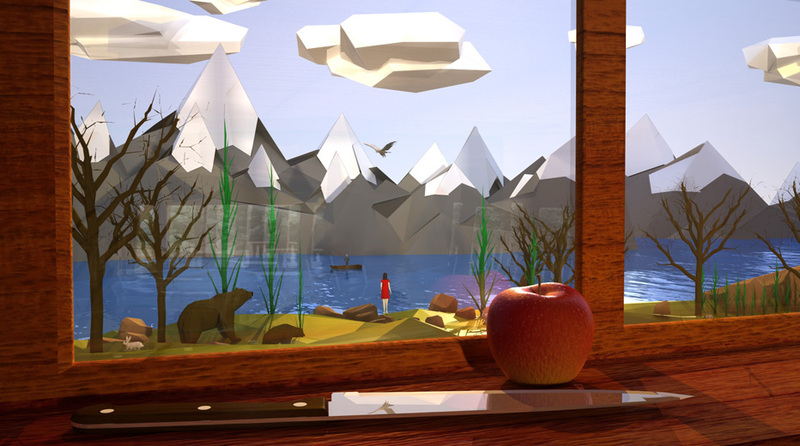 Details of the LightWave 3D Educational program are at the bottom of the page. 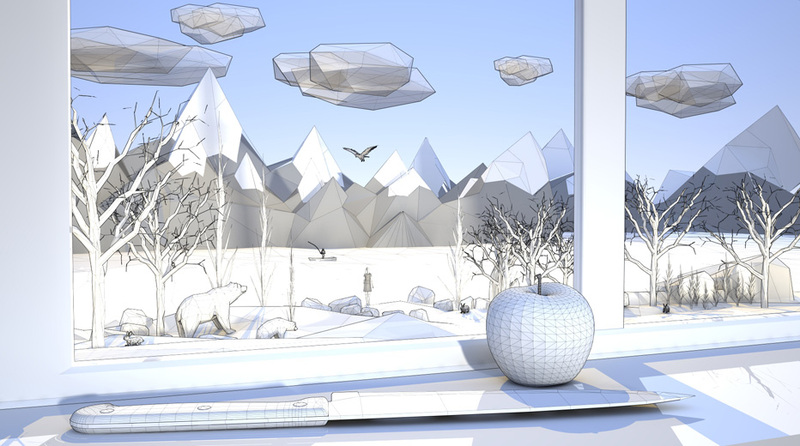 At Vision West Nottinghamshire College, affectionately known as West Notts, LightWave 3D Tutor Anthony Hall is fond of telling his Interactive Media/3D animation students, With Great Power Comes Great Creativity, and despite their amusement, they do get it. On the one hand, he means that LightWave 3D is a powerful creative tool that his students can learn intuitively and then enjoy exploring its capabilities. But taking a broader view, it’s also a powerful, cost-effective platform that can serve as a springboard into rewarding professional careers as 3D artists and animators—for companies, agencies or even as freelancers. Anthony Hall discusses the Interactive Media course he teaches, which now incorporates 3D animation using LightWave 3D. Can you tell us briefly about West Notts’ Interactive Media course and any challenges you faced expanding its scope to include 3D animation? While Interactive Media initially focused on software like PhotoShop and Dreamweaver, our teaching team recently decided to incorporate 3D modeling and animation into the course. 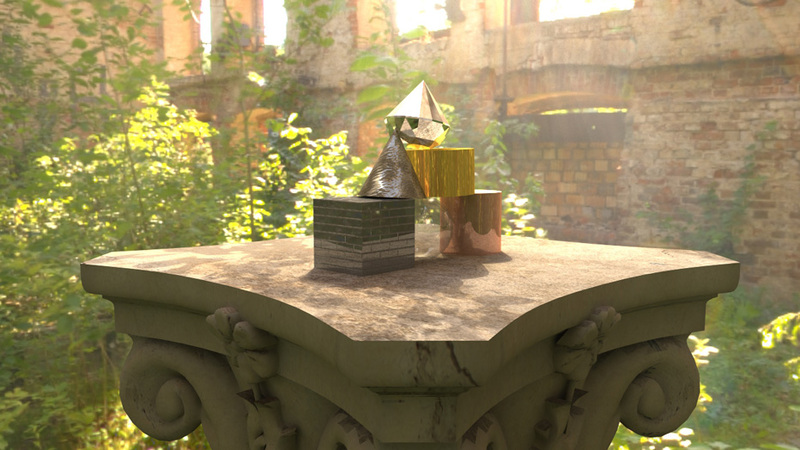 After looking at various options on the market, including 3D Studio Max, Maya, C4D and LightWave 3D; LightWave looked to be our best bet considering the quality work our students would be able to do for the price. The interactive Media students have access to over 80 Apple Macintosh computers and over 20 (6-core Xeon E5 processor/dual GPU) Mac Pro towers. We also recently purchased a Maker Bot 3D printer and have started getting the students to create LightWave 3D models to 3D print. In class, I also show the students exemplary 3D animations created by LightWave 3D artists from around the world to inspire them and set the bar high. They quickly get addicted to LightWave and love learning its capabilities on their own. What LightWave 3D features, tools and skills do you focus on and what type of work are the students producing? Besides our limited budget, another challenge we face is that our course is only two hours, once a week for 36 weeks and each class has over 20 students. So our 70+ LightWave student body must often work independently, watch online tutorials, and checkout LightWave Facebook pages and forums, which are second to none. Since our first year students have never done 3D before, they don’t know what a polygon is, let alone how to manipulate one. We cover what a polygon, edge, and point is and how you can manipulate them using LightWave modeling tools. I teach about basic primitives, box, ball, disc, as well as how to texture and light their shapes in a scene using either three-point lighting, HDR lighting as well as radiosity. Each week I introduce and demonstrate a new LightWave tool, such as Bullet, Fracture, Place-Mesh, Chamfer, Tweak and Heat Shrink, to name a few. 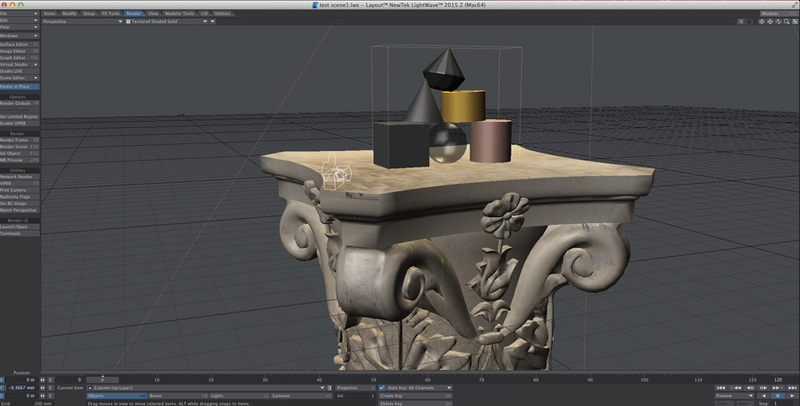 The Viewport Renderer (VPR) function is also an amazing timesaver and the students love it. As you are texturing, animating and rendering, it lets you see your work updating and changing as it processes. Another timesaving feature is Instancing. This is brilliant if you want to create many objects from one, such as a forest from a single tree, or blades of grass, or a parking lot full of cars from just one vehicle. The students are also introduced to free LightWave plugins (see the LightWave Plugins Database), as well as software like Mudbox, a sculpting-based 3D modeling system that complements the LightWave function and workflow. They’re also shown how to use After Effects, and a variety of plugins, including Element 3D, which lets you import 3D objects into After Effects where you can create credible visual effects. The students are given 3D tasks to complete in specific timeframes. 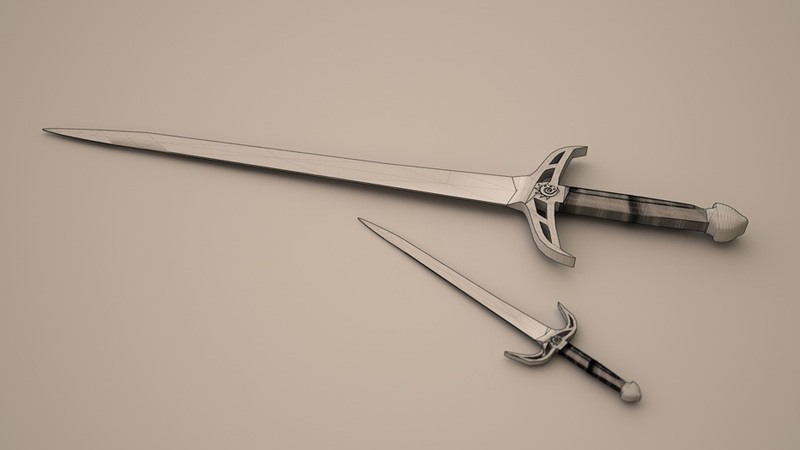 One such assignment was to use Adobe Illustrator to create a vector of a sword and then import the elements into LightWave as EPS files. 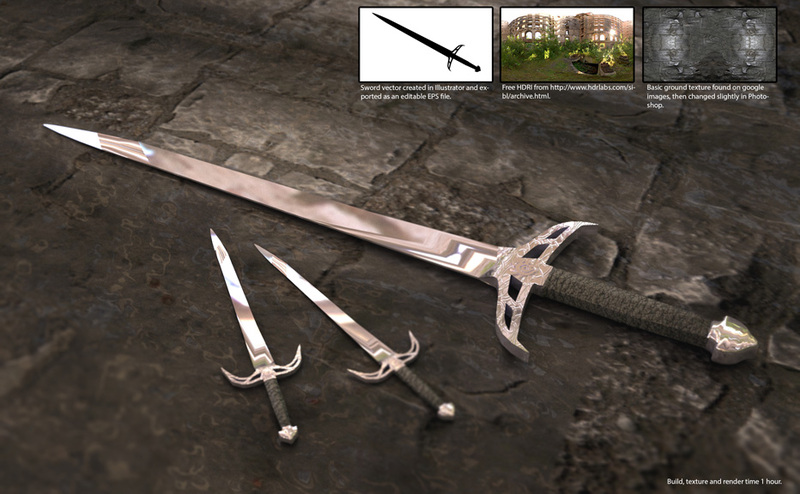 They then have to create a 3D sword in a basic scene, textured and lit, and save a couple of renders of it. 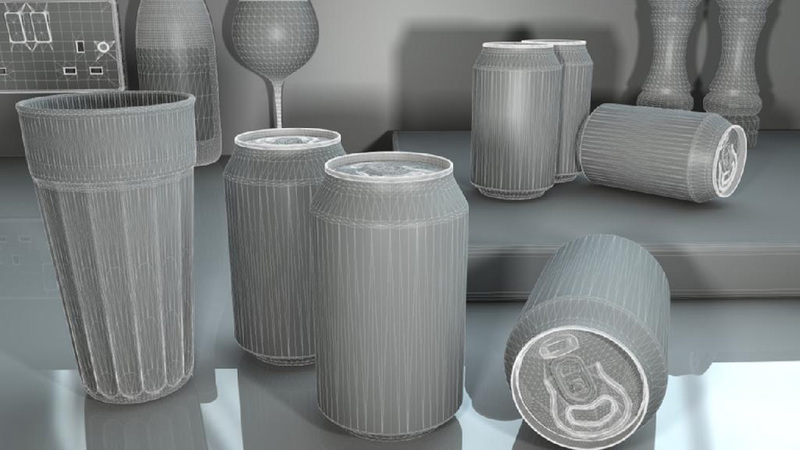 For another 3D assignment, students were given a simple 3D cola can model that was un-textured. 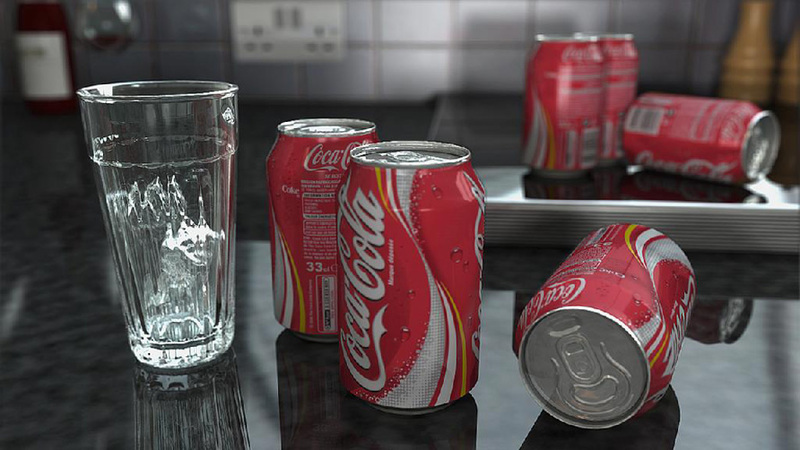 They were asked to create a 3D scene, place the 3D cola can within in that environment, add UV textures to it, light it and then render it. Before they begin, I show them what I was able to do with LightWave in just two or three hours to inspire them to do their best work. I also show them a 3D scene that took me about eight hours to create to teach them about working with low versus high poly models (below). Can you tell us briefly about the projects students have done for local companies? They learn to collaborate with clients, design storyboards, understand creative objectives, handle constructive feedback, meet deadlines and ultimately build an impressive student portfolio. Within tight 12- to 14-week timeframes, the students have tackled challenging, complex projects according to the clients’ stringent requirements. And each time, the students and LightWave delivered. The educational version of LightWave is available to eligible students and faculty members. It is the full commercial version of LightWave and comes complete with PDF based manuals, training material and content material to aid your learning path with LightWave. When you buy LightWave you will receive both Windows and Macintosh versions. Read more about LightWave here.